The exercise today is to give one last look to that difficult night on Monday against Washington. I think this is particularly relevant because of Sunday's opponent. Stylistically, it is rather seldom that you play two teams that mirror each-other's scheme defensively like Washington and Arizona. Both think nothing of a Cover 0 blitz - and these days, I bet there are fewer than 5 or 6 teams that share that view in the entire league. So, let's dive into the 5 sacks and in the interest of time, briefly consider what went wrong as Jim Haslett called an unbelievable game against Dallas - a team many people thought he had no shot at knocking off the tracks on Monday night. You can bet that Todd Bowles is taking notes. Ok, so here is the first one. So much of Washington/Arizona involves disguising coverages and blitzes. That is the NFL game where you must make the QB and the OL do mental gymnastics in pre snap. You must make them unsure as often as possible, and that is easiest on 3rd Down because they are trying to get to the sticks and therefore only have so many options. This is also why you want to "stay out of 3rd and long" when you hear the guys talk about game objectives. In 3rd and long, the defense can dictate terms if they want to risk safe coverages in exchange for causing chaos. These teams love that. But, in this case, on the first drive of the game, they are showing pressure, but then only bring 5. That means you can play coverage with zones of 6 against 4-5 targets. Check below how they are matching up early, with most of the coverage going to those players who are likely to run shorter routes to the sticks - Tight Ends and Cole Beasley. Meanwhile, you have a blitzing safety along with dropping LBs. This is another characteristic of this type of 3-4. DBs rush and LBs drop. Sometimes, a DL will drop. It is this versatility in roles that makes everything difficult to identify for an offense. If you can line up 8 guys over Romo, then as long as you are organized, any 5 can rush and you can accomplish your ultimate goal - an unblocked rusher. 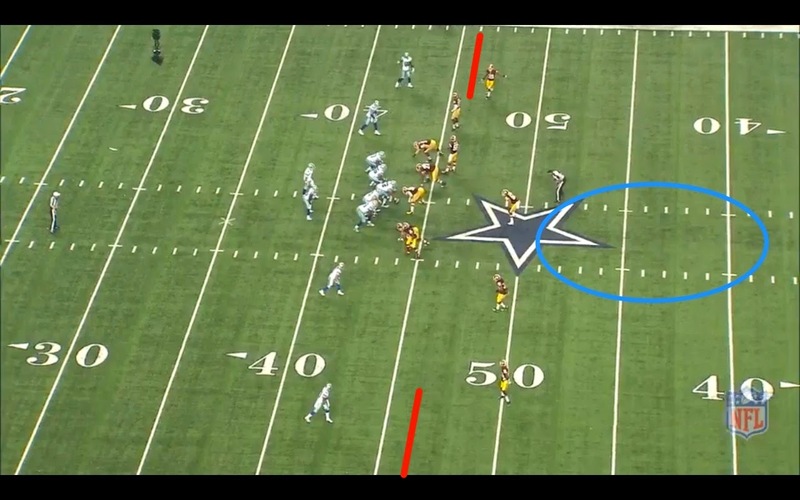 The arrow shows 31-Meriweather who arrives on Romo's blindside just as his targets are getting into their breaks. Romo senses it and spins, but the Redskins are on guard for the spin after seeing it the last several weeks. When 9 feels backside pressure, he will spin back to his left. Meriweather is now going to meet Romo at that spin point. OK, let's look at the pre snap. 73-Frank Kearse is adding to the scheme a ton by flipping his 3-tech setup from side to side as Romo sets protections - which, of course, throws the protection off. Now, after he moves, Romo directs Witten over to the opposite side which seems to be the wrong call. They are now outnumbered to the left. Frederick now changes the protection and it looks organized again if he can help Leary and Smith clean up the 3 to the right. Here, it looks to me (and this is a guess) that Tyron made the wrong decision here. If he goes out to Meriweather, they are good. But, he doesn't, he is still on 93/73 inside. So you have Frederick, Leary, and Smith blocking 2 guys and the 3rd is untouched. Then, when Meriweather sits on the outside spin, the play is dead, as is the possession. Nice idea from Washington and a sign of things to come. What you love best about this is the fact that they still had 6 in coverage so there are no major risks being taken. You are just testing the Cowboys ability to decode the plan. When Romo sent Witten to the other side and Meriweather did not follow him, that tipped off the idea that he was blitzing and/or Washington is in a zone. BUST: I think Romo and Smith are the two most likely culprits, but this is one of those cases where we have to wildly speculate given the complexity of the play. But, clearly, they did not get this one right. OK, very next possession, the ball is moving until they get into a 3rd and long. That is where Washington cooks up their next plan. They will now send the house in a Cover 0 blitz with the idea that they can bring one more than you can block - and with the added bonus of Lance Dunbar instead of DeMarco Murray. That means that you have a less-seasoned and less-capable back in blitz pickup. Above, red lines are the sticks, the blue circle shows your cover 0. So Tony knows what this means. 4 targets vs 4 defenders. That means the Redskins have 7 against 6. He has to get rid of the ball because there is nobody to get the last guy. By definition, that is his man. Look above at what he sees. He wants the slant to Dez. To get it, he has to make his man, 25-Ryan Clark miss. He does in a way he has done a million times. Now, let's look below at how the protection went. Everyone identified their guy well. But, Dunbar cannot block 56-Perry Riley for more than a moment. Romo knows this, but thinks he can still get the pass off. He thought wrong. See 73-Kearse again in pre snap? Always trying to mess with the Cowboys protection. This subtle move is consistent all night. And screws things up on many occasions. This time, they are all picked up, but Dunbar can't hold up for long. Bust: Against a Cover 0, it is completely up the QB to account for the extra man - which he did. The slant to Bryant is going to be possible and then you take your chances that Bryant will get the catch and fight for the final few yards. If there is a bust, it has to go to Dunbar - or perhaps the coaching staff that thought he could handle blitz pickup on a 3rd and long. I will take a LB over Dunbar every time. This one is bothersome, because on this occasion the Redskins are not really trying to keep the Cowboys from getting to the sticks. It is 3rd and 3, and Romo could take the conversion, but everyone knows with only :23 left in the half, he has bigger plans. Meanwhile, the Redskins are showing Cover 0, but when the play starts, their LB gets into the deep safety spot and they actually are dropping into a 6-man coverage that is pretty safe and conservative. There is 73-Kearse flipping spots again. Now, a stunt to his side where Kearse wants to mess with Parnell, leaving Kerrigan to stunt around Martin to make sure the rookie is paying full attention. 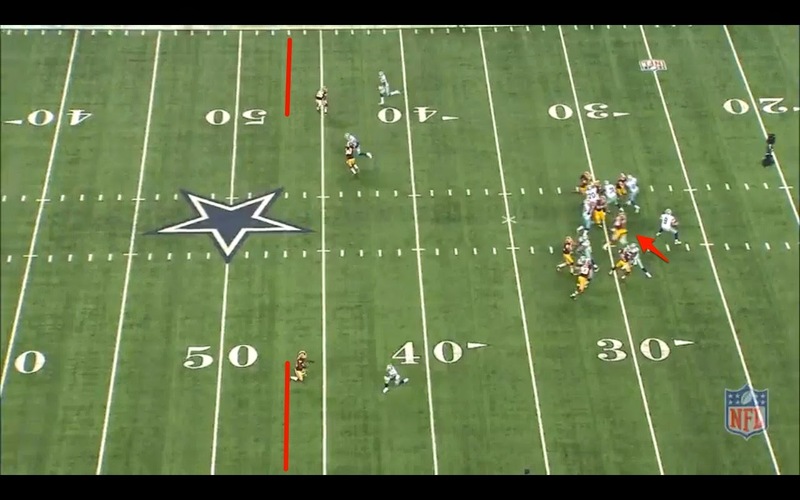 Kerrigan wins here and gets to Romo even though there was time to get the ball out quick. But, Washington knew that he would take more time to throw and caught them by being safer with a stunt on a new RT and a rookie RG. Bust: Martin has to slide over to get Kerrigan, but I am guessing the late movement of Kearse threw off his initial plan. Their attack worked great and even though Dunbar had his edge guy, the sack was still pretty easy for Washington. This is the one that greatly affected the Cowboys 2014. From a Washington standpoint, this is where you got to roll the dice to win big. They showed 7, so the Cowboys protected with 7. That means, they raised to 8. And that was one more than the Cowboys had planned for. Protect with 7 and there is your Cover 0 look - which, by the way, is not just a look. They are sending everyone on this 3rd and long early in the 3rd Quarter. The photo above shows the sticks at precisely the moment where Romo realizes he is in big trouble. The Cowboys have their protection fine with everyone blocking their man, but have not accounted for the trailer MLB blitzer. You never want the free man coming from the middle. That is why we always are hearing the coaches teach from middle-out. Take the biggest danger - middle to outside. Now, you could argue, after so many 1st half sacks, the Cowboys are still being stubborn and naive with their route concepts. It is 3rd and 12, but sometimes, in the interest of self-preservation, you run some more shallow routes and hope to break a tackle because we don't want QB1 laying motionless on the turf. If he has to wait for everyone to get out of their breaks on deep routes, he is going to have to work some magic tricks as 7 try to block 8. There is not 1 option for Romo before he gets decked. It all happens so quickly. 73-moves sides again. 97-Hatcher slants left and 56-Riley goes right to make this path you could drive a truck through for 52-Robinson on a dead sprint to try to wipe out Romo. The question then becomes who should Murray get? He elects the outside guy, 25-Clark, but I am guessing (again) that he needs to get the guy coming down main street and leave 25 for Romo to try to deal with. Either way, this is not going to go anywhere with these routes. Bust: I might vote naive coaching/QB play on this one. You simply cannot play into their hands when they are getting more and more aggressive on every 3rd down. Where is Beasley and the rub routes that they showed against St Louis? In other words, once this look is on, you have to alert some hot routes that consider the score/game situation and understand that the world does not depend on this conversion. Sometimes, you need to punt. But, if ever there was a time where you must burn their hands to get them to stop touching the oven, it seems that this is that moment. And last, but not least. The last sack. Where they now know that Romo will be wanting to hang in there and make plays down the field and not take dinks and dunks with the game on the line. They are showing Cover 1, but it looks like Quarters (Cover 4, man under) to me with a 5-man fire zone blitz in front of it. Either way, Romo wants to give a chance to some bigger routes and not seeing protection issues as he settles in before...Bam! I think we will have to assume that I have been building up Murray's blitz pickup acumen too much, as this one has to be on him. But, again, the fire zone is the concept of sending an overload blitz from one side. You send only 5, but you take advantage of the 3x3 protection concepts (the idea that C-G-T take one side and RB-G-T generally take the other). You are not outnumbering the entire line, just one side of it. But, as you can see above, if Murray just gets Meriweather, this is protected. Romo cannot assume that Murray might read it wrong. He has to depend on those in front of him to do their job and then he does his. Bust: This one is clearly on the mix-up by Murray and the non-recognition of a blitzing Meriweather. This, of course, is aided by the depth of 31 when he blitzes. For once, he is not breathing on the line of scrimmage, but in normal coverage depth. Again, I can't swear I scored all of these correctly, but I am asking those in the know for confirmation as often as possible. Feel free to speculate freely in the comments below. The idea is not to place blame, but rather to understand what went wrong and why. All in all, these plays demonstrate why my biggest takeaway from Monday night was the coaching victory of Washington's defensive scheme and the disappointing reaction from Dallas to all of these various tactics. For once in 2014, Dallas was on the short end of the football chess match. For the first time in quite a while, the Cowboys were unable to follow their blueprint for success in 2014. They have been very strong with their recipe of a dominating ground game that then used strong situational football to protect the defense by keeping them off the field. Opponents know this is the recipe, but have a hard time figuring out ways around it. Of course, we have detailed that Washington won 3rd Down often enough to throw a wrench in this plan, but they also needed some generous ball security by the Cowboys to put "time of possession" squarely in favor of the Redskins at about a 58%/42% margin. If, on a play-by-play basis, the Cowboys defense is actually a fraction worse than they were in 2013 (6.07 yards allowed per play in '13, 6.11 per play in '14), then the number of snaps conceded and time of possession is a real component to this all. With that in mind, with the exception of the Rams game, no team kept the Cowboys defense on the field for so many snaps (although this game was affected by 8 overtime plays), and even with the overtime, the time of possession % for Dallas was lower than any game this year. That is not completely on the offense, at all, because as we noted in the "Morning After" piece, the Redskins started converting 3rd Downs (and 1 4th Down) in the 2nd half that they controlled almost completely. The game will be long remembered for the Tony Romo injuries, but you can believe in Rod Marinelli-led meetings for the defensive squad this week, there will be plenty of time and focus dedicated to situational football and doing what put this team in the position it currently holds - getting off the field. There was a stretch in the 2nd half were it seemed that Colt McCoy and that offense were converting every opportunity and it served to really frustrate everyone. The Cowboys never deviated from their plans - only blitzing 22% (8 of 35) which is their season rate and the exact rate that they used against Russell Wilson and Eli Manning in the 2 previous weeks. I thought the massive key was the 3rd and goal play where McCoy and the Redskins seemed to harken back to a pivotal moment in 2013 where Robert Griffin and Sean Lee shared a memorable moment. First, let's look at Colt versus the Cowboys on 3rd and Goal from the 7. Like so many, I have been smitten with a lot of Rolando McClain's work this season. He diagnoses, seeks, and destroys at a very impressive and high level. However, this is not his finest work. The Cowboys are in nickel, so the key for the Redskins will be to get as many of the Cowboys DL to rush up field on their 3rd Down pass rush, then, since they have 5 targets in route with an empty backfield, the hope is to get man-coverage and then just have to beat the middle linebacker and safety to the goal-line. This is a great idea that is used so often, because the extra defenders are usually in the end zone and can't get to the goal-line before the QB does if he gets any blocking at all. If you look above, you see 32-Orlando Scandrick as the only Cowboy with a real chance, but his angle is not conducive to making that stop. 52-Durant also smells out pretty quickly, but he has blockers to deal with. That leaves McClain in the middle. Let's switch to the end zone view. 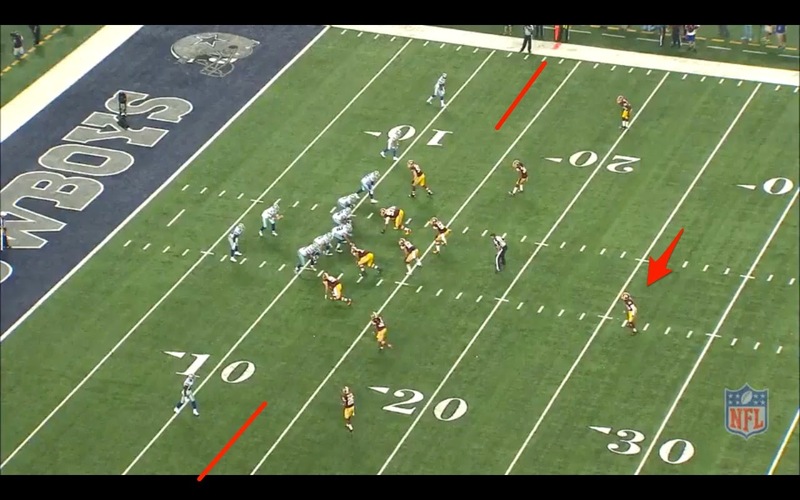 86-Jordan Reed is the player who is to occupy Rolando McClain on this play. 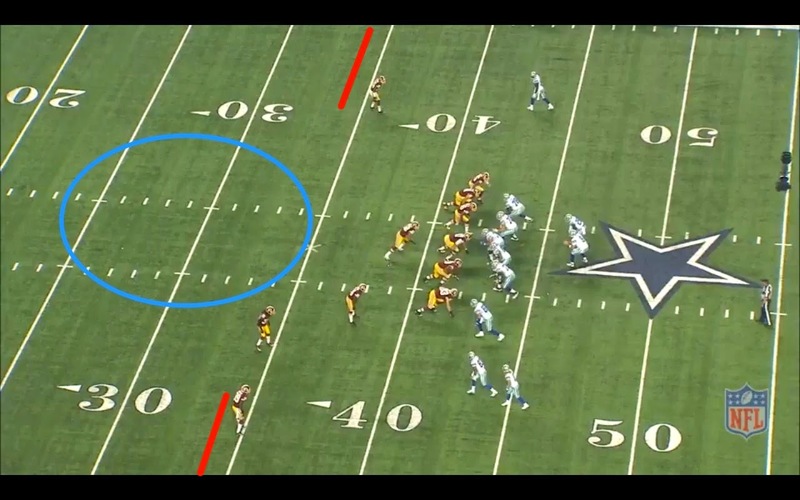 If McClain believes it is a pass, then he will be too occupied to react. But, he must if Dallas is going to have a chance here. 69-Henry Melton is the only DL to not take himself too far upfield and it appears he was held on the play. But, when McClain puts up almost no resistance until the McCoy is already in his lap, the play is doomed. He has to at least make McCoy change direction and that might give other Dallas players a chance. Instead, McCoy takes the quickest straight line route to the end zone and it is a gigantic Touchdown. Maybe I am asking too much of McClain here. Let's see how Sean Lee did last year in the exact same situation. I broke down this play from Week 6 of 2013 on this blog entry here. Some subtle differences. 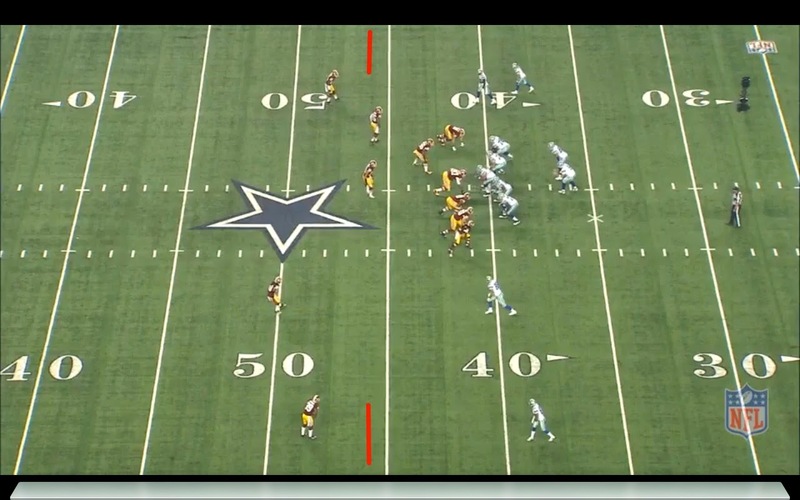 Washington is 2 yards further back, with a RB 29-Helu as Sean Lee's assignment. But, again, a clear called QB draw where it is a race to the goal-line. The Redskins have the Cowboys caught here, too. But, Lee takes on everyone and makes the stop. This view is insane to behold. Lee smells it out the second he notices the center coming at him and not only makes Griffin change direction, but also hauls off and makes the tackle on his own. It is only 1 play and both players are remarkable. But, it does show that sometimes recognition and diagnosis can be an amazing substitute for speed. Lee saw what was happening way quicker and was able to do something about it. On this particular play during a season of impressive accomplishments, McClain looked unaware of what was happening in front of him until it was too late. Subtle, but costly. One other point that is worth making is that the Cowboys were able to find 3 sacks on Monday, including one that might have saved the game if a few things happened differently that were out of the defense's control. Here it is - 2:16 left in the 4th Quarter and Washington has a 3rd and 10 from the Cowboys 37. You have to figure that even a few yards puts them in FG range, so if the Cowboys can, they need a negative yardage play. Do they blitz? No way. They unleash the ghost of DeMarcus Ware for a classic bull rush/shed move against Trent Williams. Williams has played 532 snaps this season and had not allowed a sack - until this one. Mincey has not been able to get home, but he has really impressed with his motor this year and has been an unsung hero after his arrival barely got a headline. The sack knocked the Redskins out of field goal range and the game was saved. The hope is that DeMarcus Lawrence provides more of this type of things, but for this move to happen at this moment in the game is fantastic work. It is a shame it hasn't been discussed much, but for it to have been properly recognized, we would have needed the offense to come through. Such is football. DEFENSIVE PARTICIPATION: The big story here is that Justin Durant tore his bicep and is now lost for the season - putting the 3rd Defensive starter on the Injured Reserve list (with Lee and Claiborne). What this means is that there will not be a game this season where the opening day trio of Linebackers - Justin Durant, Bruce Carter, and Rolando McClain will actually play the entire game together. The trio started the SF, NO, and Wash games together, but in each case one of them left with an injury. The other 5 games had at least one of them missing, as will the remainder of the season. In steps Anthony Hitchens with Kyle Wilber standing by. Depth matters for sure as Lee and Devonte Holloman were gone in the preseason and now Durant is gone, too. Attrition at linebacker alone demonstrates that this is a marathon, not a sprint and you better assume that you will need your 7th choice LB at some point. Thankfully, the DL is going in the other direction with players actually being added who all seem to have intriguing upside. Terrell McClain and Anthony Spencer in October, with Lawrence and maybe even Josh Brent in November. Weird year. Again, situational numbers are not so great. Washington went 6 of 11 on 3rd/4th down situations in the 2nd half and was able to get TDs on both trips inside the red zone. 16 splashes against the Redskins, with a remarkable 3 sacks in 1 game! The cream is rising to the top in the seasonal rankings. Henry Melton is climbing quickly as is Orlando Scandrick. Just as you might suspect from Colt McCoy. 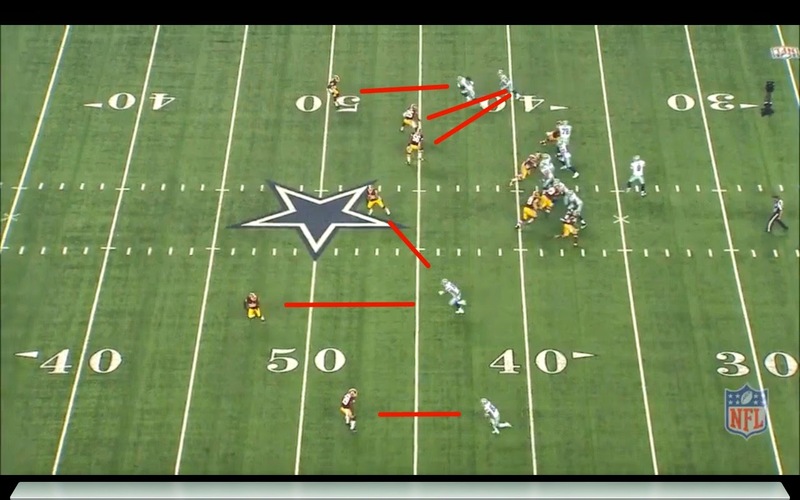 Lots and lots of horizontal passes to set up a few deep kill shots to DeSean Jackson. As you saw above, Eli was not troubled much by the Cowboys blitz. They still can't figure out how to get to the QB. Close doesn't count for too much. SUMMARY AND LOOK AHEAD: When looking at a football game, you cannot grade an offense or defense purely on win or loss. Each play must be studied and graded on its own and understand that in a win there can be a lot of bad and in a loss there can be a lot of good. Personally, I saw that on Monday night. I thought the broken tackles were an issue that needs to be discussed and Barry Church and the linebackers were victimized on that quite a bit. However, I thought we saw the best performances of the season from Henry Melton, JJ Wilcox, and maybe even Justin Durant and Tyrone Crawford. I hesitate to say that about Crawford because he is routinely amongst the best defenders every game. I am starting to think they really have a star in big Tyrone who is doing everything that Jason Hatcher might have done last season. The defense only gave up 20 points and the game was in overtime. That has to be enough to win the way this team is built. At the same time, one more situational stop of any kind and they might have survived a game in which QB1 is lost for the majority of the 2nd half. It basically comes down to what we said above. A snap here and there is the difference between victory and defeat and this is how the league works. Stop that QB draw and maybe you win the game. Consider it the opposite of what happened against Houston or Seattle and figure that these things have a way of evening themselves out. Halfway through the schedule and the defense has settled in to being what everyone hoped - about a league-average defense. With the offense they have built, that should generally be good enough. But, with Romo's status iffy, the defense might be asked to win a crucial game or two in November. On Tuesdays, we are normally breaking down the Cowboys offense with lots of fancy pictures and video from the game that was. Well, it was Monday Night Football this week, of course, and therefore we are rolling this out on Wednesday. On top of that, because of the odd blackout rules for MNF (and the game-changer, NFL Game Rewind), we are forced to act like this is 2010 and to decode Linehan with just words and maybe a few charts! Bear with me this week - we won't be defeated - but the video breakdown will have to wait for Thursday and Friday, but I do have big plans to look at what derailed the Cowboys train on Monday Night - the blitz and the subsequent issues that causes. Ok, let's get down to business. The Cowboys lost on Sunday for the first time since September 7th. 50 days without a defeat is certainly rarified air, but after the events of Monday night, we see how slim the margins truly are in the NFL. The Cowboys have been successful because they have been so efficient in 2014. They have not beaten themselves and they have been great at the two "situational football" categories that we are always harping on - 3rd Down conversions and Red Zone conversions. Basically, when any team is going well, they are taking great advantage of their opportunities - which is what any opponent wants to attack the most. Again, credit the Redskins for being able to do something that no other opponent has done in 2014 - slow down Dallas on 3rd Down. A great discussion about the offense is 2014 is what is the most vital component - the dominant #1 running game or the #1 3rd Down offense that allows the dominant running game to continue eat up the clock and take over the game. As you can see below, the Cowboys 3rd Down Conversions have really been just as big an accomplishment for Romo/Linehan/Garrett as anything they have done running the ball. In 2013, they were horrible on 3rd Downs, stuck at 35% at 63-180. In 2014, they have set the pace for the entire league at 59-106 or 56%. The national conversation about the Cowboys never discusses this component of the entire formula, because it doesn't really fit with their "The Cowboys are winning because they are using Romo less" narratives, but his performance (along with his offensive mates) has brought this whole thing together. So, we can look at that above chart a few ways. 1) they are way more dependent on this 3rd Down conversion rate than we are willing to admit. 2) they were due for a bit of a market correction as the rate they were at was simply unsustainable. and 3) it is only 1 week, Bob. Let's see a few more teams slow down the Cowboys on 3rd Down. And remember, when Jason Garrett was doing one of his tennis court press conferences in sunny Oxnard back in July, he addressed the fact that the difference between a disastrous 3rd Down season and an average 3rd Down season is simply one more conversion a game. That is certainly a very "Bull Durham" approach to statistics, but it is pretty close to the truth. But, the Cowboys are basically on course for an uptick of 2 per game, which takes them from the bottom group in the league to #1. And if they are going to be converting on 3rd Downs at a level above the annual leaders in Denver (Peyton Manning) and New Orleans (Drew Brees), then you can best believe that opponents who see Dallas on the schedule are going to burn the midnight oil to try to figure out ways to slow them down. Which brings us back to the original question: What is more vital to the performance of the offense in 2014? The running game on 1st and 2nd down or the 3rd Down conversions? Well, if you look at it from the perspective of Washington Defensive Coordinator Jim Haslett or Arizona Defensive Coordinator Todd Bowles, you are asking yourself what you have a better chance of slowing down. If you were to roll the dice in a game against the Cowboys, which one might you have a chance to take away? Think about it the way coaches see a great basketball team - we can't stop Jordan, but let's focus on making sure Pippen doesn't go nuts. Slow down the area that we have a realistic chance of slowing them down. Stop the Dallas running game? Washington actually did pretty well on slowing down the zone plays, but then Dallas started pounding them on the pulling guard, "G Power" plays and ended the night with a fantastic 25 carries for 166 yards. 6.64 yards every time you call a run play? That is a great performance and 160 yards is the average for this team after 8 games. The running game did its job (save for the fumbles). On 1st down, the Redskins sent pressure at a reasonable 30% rate. On 2nd down, they cranked it up a bit more to 34%. But, on that all important money down? On 3rd Down, as we talked about yesterday, the Redskins blitzed on 100% of the scenarios. Just to compare, the Cowboys have received pressure in 2014 on 3rd Downs on 26 of 74 occasions (35%) before Monday. Then, on Washington laughs at that and sends them on 12 for 12 (if you include the 4th down that ended the game). We will never know if they planned that all along, or were just going to send them early to see how Dallas would respond. When the 1st two drives were blown away by blitzes, the Redskins confidence grew and the Dallas counter punches were nowhere to be found. It absolutely makes us all wonder about where the "rub routes" that we have seen this season were. Now, Washington would show 7 and blitz anywhere between 5 and 7. That means if you were just going to drag Beasley and Bryant across the linebacker zones, know that you might get tricked into throwing a pick to a dropping LB who bluffed his blitz. That has happened many times against Washington over the years (the retired LB London Fletcher seemed to make a living off it) and the cat and mouse game was won big by Washington. They had the benefit of playing like they had nothing to lose (as 2-5 teams will do) and got away with it. Their power is based completely on "showing" that you will bring 1 more than they can block. And, then you actually bring that many enough to spook the opponent. 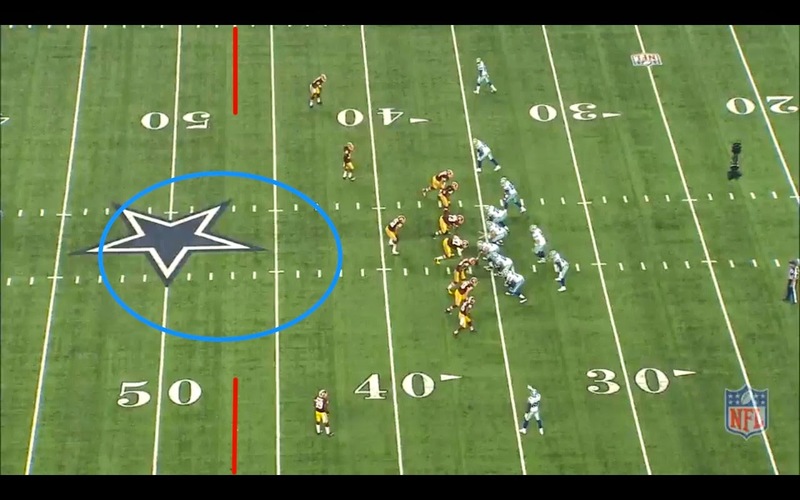 Honestly, it seems that this is a very logical approach to dealing with Dallas on 3rd Downs. Especially when you consider the physical skills and health issues of Tony Romo. Challenge him with force and see if you can get Dallas off the field. It might be your only way to slow their machine down. So, what does Dallas do? They try to avoid these situations by passing in running downs. 2nd and 2? Pass! Because maybe there you don't have to try to pass with 7 guys blitzing. And before long, you have basically played right into their hands because now you are not doing what you are best at doing. 6.64 yards per carry. It is just one game, but you do wonder if the blueprint has been shown to the league on what Dallas least enjoys. Offensive Participation: Again, no Doug Free at Right Tackle with Parnell in again and filling the spot pretty well. Meanwhile, late in the game, Ron Leary left after regulation and we saw the first 2014 action from Mackenzy Bernadeau in overtime. 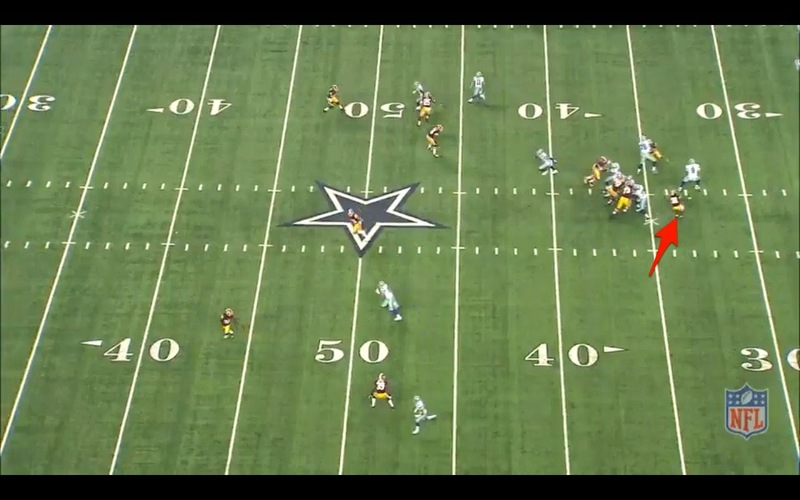 They tried to get DeMarco Murray time off by splitting 20 snaps between Randle (8) and Dunbar (12). Also, Tyler Clutts provided a full back for 10 snaps. The oddity was back with the tight ends where Gavin Escobar, one week after his breakout performance against the Giants played just 6 snaps. Curious, for sure. Against Houston and Washington he barely plays, and against Seattle and New York, he plays a lot. Is this a 3-4/4-3 thing? All snap numbers courtesy of PFF and they include all snaps including plays that were not official because of penalties. A couple notes here. The Cowboys had 2 Giveaways (and several more where they flirted with the idea) and also were not red zone efficient. It says 1 for 2, but if you consider that the DeMarco lost fumble at the 6 is not scored as a red zone opportunity (because no play started inside the 20), I mentally note that we must consider that 1 for 3. And, that is not efficient enough to only get 10 points from 3 trips inside the red zone. Must do better than that. It is clear their intent on every drive they start. The tendencies are incredibly extreme. They must be setting someone up for the 1st play deep shot. As you can see, 28 pass plays from S11 resulted in just 120 yards. That is not the YPA they are looking for and again a real credit to Washington and a debit to the Cowboys in game tactics. Big thanks to John Daigle for the work on the charts each week. SUMMARY AND LOOK AHEAD: With word filtering out today that Tony Romo's back is not going to send him to the injured reserve, we can assume the team will prepare both QBs to play this week against Arizona. The Cardinals love to send pressure and to do it regularly and from everywhere. This is the first real adversity the Cowboys have tasted in a while and it will be very interesting to see how they handle these next two weeks. You cannot take any game for granted in this league, but I would like to believe that Brandon Weeden can split the next 2 games (at worst) before the bye week, and therefore, I may have to take that gamble and attempt to rest Romo and allow him to heal 27 days until the Giants game on November 23. That, of course, is coming from a guy who has no intimate knowledge of the condition of Romo and his back, other than what we all saw on TV on Monday. Personally, I think it is a very bad gamble to ask him to come back on a short week and deal with the high-pressure Arizona attack unless he is fully fit. This is where things get a little complicated, but the Cowboys are 6-2 for a reason. They have many things going for them and simply need to clean up a few messes. But, the main reason I was bearish on this 2014 season is that I did not believe Romo could make 16 starts (or 12) with his back issues. And, I believe if they lose Romo for an extended time, their ceiling drops considerably. So, from where I sit, now is not the time to throw caution to the wind. Be careful with #9 and use him judiciously through this portion of the season that must be navigated with care. Meanwhile, get Weeden ready to go and focus next week on turning those big guys up front loose.